When it comes to kids' crafting projects, modeling clay is a perennial favorite. The tactile, hands-on nature of this material makes it engrossing for even very young children while allowing for a high degree of creativity. While most kids will have little trouble coming up with many of their own ideas for their clay, a little direction from an adult can help them get the most out of the modeling process. There are a few basic shape techniques. These shapes are not only be fun to learn, they'll help children gain a basic mastery of molding and of forms that can become the foundation of some simple projects. A very easy shape to start with is the long, thin cord. Show children how to place a piece of clay between their flat hands and their work surface and roll it back and forth to create a long, thin cord of clay. Forming a ball of clay is done in a similar fashion, though instead of rolling the hand straight back and forth, the clay must be rolled in a circular motion to form a ball. Next, teach children to make a cube by first making a ball, then pressing it lightly against their work surface to form six sides. A similar technique can be used to create a triangular prism or pyramid shape. A flat surface, like a pancake, is also easy to form from a ball. Simply show the children how to press it against the work surface until it is fully flattened. Once children have learned some basics of shaping, they can start some simple projects. One of the easiest things to make is a snowman. Have the kids take three pieces of clay in small, medium and large sizes and form them into balls. 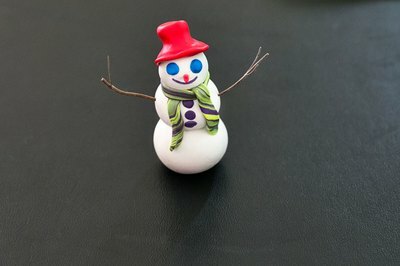 Stack these from larger on bottom to smaller on top, then decorate the snowman using a toothpick or a similar tool to draw a face and buttons. A caterpillar can be made in a similar fashion. Have the kids form at least five or six balls, smaller than those for the snowman and of the same size. String them together and give the ball in front a face. The cord shape in clay can be used to create two simple, but handsome creatures: a snake (form a cord into a wavy, curvy shape) and a snail (roll the cord up, then flatten one edge of the coil against the table). For children looking to create a gift item, or just something useful, teach the art of making a bowl shape from a large ball of clay. Show the children how to press their thumbs into the center of the sphere, then pinch and pull out in order to form the hollow. This can be used to create a bowl, ash tray or votive candle holder. A simple house can be made by combining a cube shape with a triangular prism. Place the prism shape on top of the cube and etch windows and doors into the front of the house with a toothpick. Once children have finished with their creations, they might want to keep them forever. For this reason, it's a good idea to let kids practice and play with non-hardening clay (such as plasticine), but also to let them work with a hardening clay at least once in a while. Air-dry clays are available in most craft stores, as are oven-baked polymer clays, which are excellent for small projects. Use these kinds of clay to guide children in creating projects than can double as gifts for familiy members on special occasions.